U.S. special operations forces are doing more things in more places than ever before. They are now active in some seventy countries and, since 2001, have seen their combined budget nearly quintuple—a trend that seems likely to continue. As the United States seeks ways to tackle a range of security threats worldwide, shore up the resilience of its friends and allies against terrorist and criminal networks, and minimize need for large-scale military interventions, the importance of special operations forces will grow. Yet, writes Linda Robinson in this Council Special Report, the strategic vision for special operations forces has not kept pace with the growing demands for their skills. Most people—and, indeed, many policymakers—associate the special operations forces with secret nighttime raids like the one that targeted Osama bin Laden: tactical operations against a particular individual or group. The abilities of special operations forces, however, extend much further, into military training, information operations, civil affairs, and more. 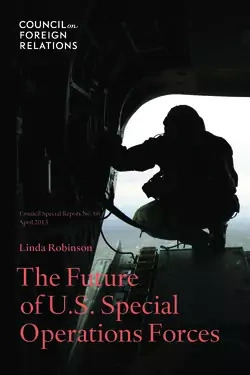 As the United States shifts its focus from war fighting to building and supporting its partners, Robinson argues, it will become critical to better define these strategic capabilities and ensure that special operations forces have the staffing and funding to succeed. Robinson further calls on the Pentagon to remove bureaucratic and operational obstacles to cooperation among the special operations forces of each service, and between special and conventional forces. She also recommends that all special operations forces commands work to develop a pipeline of talented, motivated officers with expertise in these issues, and that the role of civilian leadership in budget and operational oversight be reinforced. The Future of U.S. Special Operations Forces is a timely report on the future of what may become the military's most important troops. It offers a broad set of recommendations covering institutional, operational, and intellectual reforms that could improve the versatility and effectiveness of the special operations forces. As the Pentagon seeks new ways to exert American power in an era of lower budgets and higher aversion to wars on the scale of Iraq and Afghanistan, this report argues that expanding the role of special operations forces can—and should—be high on the agenda.